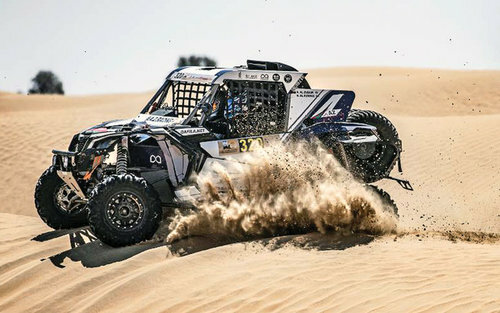 Omani driver Abdullah al Zubair and his AZ Racing teammate Nasser al Kuwari endured a frustrating second round of the FIA World Cup for Cross Country Baja season at the Dubai International Baja in Dubai, UAE, as the duo ended sixth in its class and 22nd overall. 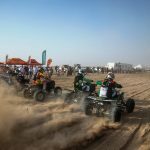 Going into the event second in the standings in T3 class, a promising opening leg on Friday, which concluded with the squad third in class, was ruined during next round on Saturday, by a series of mechanical woes. 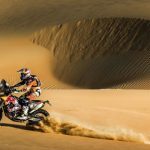 Despite differential problems just metres from the start on their BRP Can-Am Maverick X3, [they had to continue with power through only two wheels], and followed by driveshaft failure before reaching one quarter distance of the 205km stage, Zubair and Kuwari still managed to salvage much-needed points. Following the rear driveshaft failure, the car got stuck on a sand dune and while attempting to free the vehicle, it flipped onto its side. 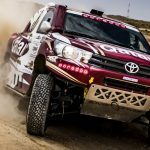 Rather than incur a costly non-finish, they crawled the car back to the finish of the rally to finish sixth in their class. 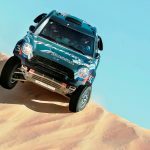 The third round of the Baja season takes place in Italy from June 20-23. 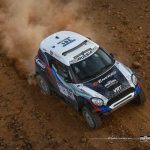 Prior to that, the duo will race in the FIA Cross Country Rally World Cup round two in Abu Dhabi from March 30. 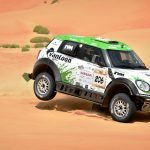 Results: 1 Jakub Przygonski/Timo Gottschalk 5hrs:15mins:10secs, 2 Khalid al Qassimi/Xavier Panseri 5:16:20, 3 Martin Prokop/Jan Tomanek 5:18:22, 22 Abdullah al Zubair/Nasser al Kuwari 29:45:37.